Cranes from electric DC-Powered to a Hydraulic Powere. All Designed to the highest standards. ​Liftmoore has been manufacturing quality crane products since 1961. 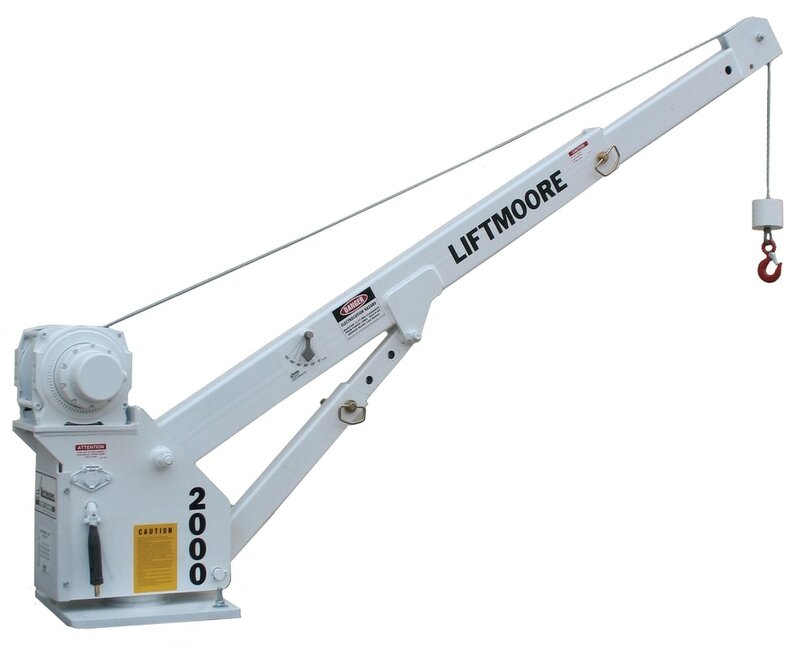 Liftmoore has one of the largest lines of cranes, ranging from our smallest 800 lb. max capacity (4,500 lb. moment rated) DC powered unit, to our largest 10,000 lb. max capacity (72,000 Moment rated) hydraulic powered unit. 4,500 ft.-lb. moment rating and 800 lb. max capacity. 800 lb max capacity at full extension. Ideal for lifting heavy objects into 1/2 & 3/4 ton pickups. Folding boom with four ( 4 ) preset positions. Boom stores vertically for travel. Planetary gear reduction winch for best possible efficient operation. 25' of 3/16' galvanized aircraft cable with 4200 lb breaking strength. Rotates of tapered roller bearings for ease of movement. Telescopic boom from 3.8 ft. to 5.75 ft. with intermediate position at 4.8 ft. Pedestal height can be varied to fit a wide variety of custom applications. Optional ATB available if crane is to be used in Construction. The L-21 crane is designed to allow one man to easily load heavy objects. The folding boom takes up minimal bed and overhead space when folded for travel. In the 20 degree elevated position the boom telescopes from 3 ft. to 5 ft. with a 4 ft. intermediate position. Available with boom lengths of 3 ft. to 5 ft. on the L-21 or 3 ft. to 7 ft. on the L-21-7. The crane rotates on tapered roller bearings for ease of moment and long life. A manual band brake is used to control boom swing. 6,000 ft.-lb. moment rating and 2,000 lb. max capacity. 6,000 ft.-lb. moment rating and 2,000 lb max capacity. Designed with the Water & Sewer Maintenance Departments in Mind. 62′ of winch cable raises and lowers pumps out of manholes with ease. 12V DC planetary gear winch w/ 2.7 HP permanent magnet motor. Single line capacity of winch is 2,000 lbs. Two boom positions of 20 and 45 degrees. Boom telescopes from 3′ 3″ to 5′ with an intermediate position at 4‘. Optional boom is available with a length of 3′ 3″ to 7′ 3″. Optional boom gives a hook height of 105″ above mounting surface at 45 degrees and full extension. Boom folds for travel to take up minimum bed space. Rotates on tapered roller bearings for long life and easy movement. A manual brake band is used to control swing of boom. 360 Degree manual rotation on tapered roller bearings. Manual boom elevation with 5 predetermined settings. A band brake is provided to control boom swing. Manual telescopic boom from 5 ft. 6 in. to 9 ft. is standard. Planetary gear drive winch for best possible efficiency, powered by a 2.7 HP 12V DC motor. Single line capacity of winch is 2,000 lbs. eliminating the need for a travel block. 40 ft. of 1/4" galvanized aircraft cable with 7,000 lb breaking strength. Power boom elevation is incorporated into this compact design allowing the operator to manipulate the load radius with a suspended load. Standard boom length 5.5 ft. with a manual pull out to 9 ft. with an intermediate position at 7 ft.
Planetary gear driven winch is standard for the best possible efficiency. Unlimited manual rotation on tapered roller bearings for easy movement. A band brake is included to control boom swing. 35' of 3/16" Galvanized Aircraft Cable with 4200 lb. breaking strength. Pedestal Heights can be varied for many custom applications. Unlimited 12V dc powered rotation is standard.Boom length is 5.5 ft. with a manual pullout to 9 ft. with one intermediate position. Gas spring assisted manual boom elevation from 0 degrees to + 75 degrees is standard. Planetary gear driven winch is standard for the best possible efficiency. 35' of 3/16". Galvanized Aircraft Cable with 4,200 lb. breaking strength. Pedestal heights can be varied for many custom applications. Power boom elevation and power rotation are standard. Boom elevation from 0 degrees to + 75 degrees. 12V DC powered hydraulic pump powers both elevation and rotation. Boom length is 5.5 ft. with a manual pullout to 9 ft. with one intermediate position. The hoist winch uses a planetary gear drive for best efficiency. 35' of 3/16" galvanized aircraft cable with 4,200 lb. breaking strength. Pedestal heights can be varied for many custom applications. Power elevation from -5 degrees to + 75 degrees. 360 degrees manual rotation. Rotates on tapered roller bearings for ease of moment and long life. Standard boom is 6 - 10 ft. - 14ft. with its two section boom assembly. Load sensor is standard. 2000 lb. single line capacity planetary gear winch with 2.7 Hp motor. 62 ft. of 1/4" galvanized aircraft cable with 7,000 lb. breaking strength. Optional ATB available if crane is to be used in construction. Hydraulically powered boom folds under power for storage. Power boom extension from 5.5 ft. to 8.5 ft. with manual pull out to 11.5 ft. Unlimited power rotation. Planetary gear drive winch for best possible efficiency. 50 ft.of 3/16" galvanized aircraft cable with 4,200 lb. breaking strength. Optional ATB available if crane is to be used in construction. Anti two-block is standard. Optional wireless radio controls are available (wireless controls maintain the use of standard wired pendant). Hydraulically powered boom folds under power for storage. Power boom extension from 5.5 ft to 8.5 ft. with manual pull out to 11.5 ft. Unlimited power rotation. Planetary gear drive winch for best possible efficiency. 50 ft.of 3/16" galvanized aircraft cable with 4,200 lb. breaking strength. Anti two-block is standard, required when crane is to be used in construction. Optional wireless radio controls are available (wireless controls maintain the use of standard wired pendant). Power elevation from -5 degrees to + 75 degrees. Power rotation is unlimited. Manual boom extension telescoping from 6 - 10 - 14 ft. is standard. Anti two-block & load sensor are standard. 2000 lb. single line capacity planetary gear winch with 2.7 Hp motor. 62 ft. of 1/4" galvanized aircraft cable with 7,000 lb. breaking strength. Optional wireless radio controls are available. Power elevation from -5 degrees to + 75 degrees. Power rotation is unlimited. The 3200REL manual extension from 7 ft.-11 ft.-15 ft. with its two section boom. The 3200REE power extension from 7 ft.- 11 ft with a 4 ft. pull out to 15 ft. A load sensor & anti two-block is standard. 2000 lb. single line capacity planetary gear winch with 2.7 Hp motor. 62 ft. of 1/4" galvanized aircraft cable is standard. Minimum breaking strength is 7,000 lbs. Optional wireless radio controls are available for both models (wireless controls maintain the use of the standard wired pendant controls). Power elevation from -5 degrees to + 75 degrees. Power rotation is unlimited. Power extension from 7 ft.-11 ft. with a 4 ft. pull out to 15 ft. is standard. A load sensor & anti two-block is standard. Cylinders have a integral counterbalance valve for safety, this valve holds the load in the event of hose failure and controls the rate of boom decent. 2,000 lb. single line capacity planetary gear winch with 2.7 Hp motor. 62 ft. of 1/4" galvanized aircraft cable is standard. Minimum breaking strength is 7,000 lbs. Optional wireless radio controls are available (wireless controls maintain the use of the standard wired control). Power elevation from -5 degrees to + 75 degrees. Power rotation is unlimited. Power extension from 9 ft.-15 ft is standard. Load sensor & anti two-block is standard. All cylinders have a integrally mounted counterbalance valve. 2,000 lb. single line capacity planetary gear winch with 2.7 Hp motor. 62 ft. of 1/4" galvanized aircraft cable is standard. Minimum 7,000 lb. breaking strength. Optional wireless radio controls are available (wireless controls maintain the use of the standard pendant ). Power elevation from -5 degrees to + 75 degrees. Power rotation is unlimited. The 4000X-16 has power boom extension from 8 ft. to 12 ft. with a 4 ft. manual pull out to 16 ft. The 4000X-20 has power boom extension from 10 ft. to 16 ft .with a manual pull out to 20 ft. Efficient 2,000 lb. single line pull planetary style winch with a 2.7 Hp. permanent magnet motor. 75 ft. of 1/4" galvanized aircraft cable with a 7,000 lb. breaking strength. Optional wireless radio controls are available (wireless controls maintain the use of the standard wired pendant ). Optional ATB available if crane is to be used in Construction. 25,000 ft.-lb. moment rating & 5,000 lb. max capacity. Power elevation from -5 degrees to + 75 degrees. Unlimited power rotation. Rotates on gear bearing slewing ring. Two standard models are available. 5000WX-20 power extension from 10 ft.-16 ft. with a manual pull out to 20 ft. 5000WX 12-20 power extension from 12 ft. - 20 ft. Planetary gear driven winch with 2.5 Hp series wound motor. 80ft. of 5/16" galvanized aircraft cable, 9,600 lbs. breaking strength. All cylinders incorporate an integrally mounted counterbalance valve for safety. Pressure switch and anti two-block are standard features. Optional wireless radio controls are available (wireless controls maintain the use of the standard wired pendant ). Power extension from 10 ft.-16 ft. with a manual pull out to 20 ft. Power rotation is unlimited. Rotates on gear bearing slewing ring. Power elevation from -5 degrees to + 75 degrees. Anti two-block and pressure switch are standard. Planetary gear driven winch with 2.5 Hp series wound motor. 90 ft. of 5/16 6 X 36 wire rope with 10,540 lbs. breaking strength. All cylinders incorporate an integrally mounted counterbalance valve for safety. Optional wireless radio controls are available (wireless controls maintain the use of standard wired pendant). 36,000 ft.-lb. moment rating & 6,000 lb. max capacity. Power elevation from -5 degrees to + 75 degrees. 370 degree limited power rotation. The 1032XP-15 has power extension from 7 ft.-11 ft. with a manual pull out to 15 ft. Proportional Hydraulic Control System is now standard. Both load sensor & anti two-block are standard. Planetary gear winch for best efficiency. 62 ft. 1/4 " galvanized aircraft cable with 7,000 lbs. breaking strength. Wireless controls are standard on the 1032XP-15 crane. Optional wired Control pendant available. 16,000 ft.-lb. moment rating & 4,000 lb. max capacity. Power elevation from -5 degrees to + 75 degrees. 370 degree limited power rotation. The 1640X-16 has power boom extension from 8 ft. to 12 ft. with a manual pull out to 16 ft. The 1640X-20 has power boom extension from 10 ft. to 16 ft. with a manual pull out to 20 ft. Both load sensor & anti two-block are standard. Planetary gear winch for best efficiency. 70 ft. of 1/4" galvanized aircraft cable with 7,000 lbs. breaking strength. Optional Wireless controls are available. Power elevation from -5 degrees to + 75 degrees. Unlimited power rotation. Rotates on a gear bearing driven by a worm gear box with a 45:1 ratio. The 2550X-20 has power boom extension from 10 ft. to 16 ft. with a manual pull out to 20 ft. Both load sensor & anti two-block are standard. All cylinders have a integral counterbalance valve for safety, this valve holds the load in the event of hose failure and controls the rate of boom decent. 80 ft. of 5/16" galvanized aircraft cable with 9,800 lbs. breaking strength. The 2550XP 12-20 has a planetary style winch & power boom extension from 12ft to 20 ft. and comes standard with wireless proportional controls. 30,000 ft.-lb. moment rating & 5,000 lb. max capacity. Power elevation from -5 degrees to + 75 degrees. Unlimited power rotation. Rotates on a gear bearing driven by a worm gear box with a 45:1 ratio. The 3055DXP-20 has power boom extension from 10 ft. to 20 ft. Both load sensor & anti two-block are standard. All cylinders have a integral counterbalance valve for safety, this valve holds the load in the event of hose failure and controls the rate of boom decent. Wireless proportional controls are standard. Power elevation from -5 degrees to + 75 degrees. Unlimited power rotation. Rotates on a gear bearing driven by a worm gear box with a 45:1 ratio. The 3660X-20 has power boom extension from 10 ft. to 16 ft. with a manual pull out to 20 ft. The 3660XP-20 has power boom extension from 10 ft to 16 ft. with a manual pull out to 20 ft. and is standard with wireless proportional controls. Both load sensor & anti two-block are standard. All cylinders have a integral counterbalance valve for safety, this valve holds the load in the event of hose failure and controls the rate of boom decent. Optional wireless controls available for the 3660X with the on/off control system. 40,000 ft.-lb. moment rating & 6,400 lb. max capacity. Power elevation from -5 degrees to + 75 degrees. The 4064XP-22 has full power extension from 10 ft.-22 ft. The 4064XP-30 has full power extension from 14 ft.-30 ft. Unlimited power rotation. Rotates on a gear bearing with external gear driven by a worm gear box with a 45:1 ratio. Both load sensor & anti two-block are standard. All cylinders have a integral counterbalance valve for safety, this valve holds the load in the event of hose failure and controls the rate of boom decent. Planetary gear winch for best efficiency. Wireless Proportional control system is standard. 50,000 ft.-lb. moment rating & 8,000 lb. max capacity. Power elevation from -5 degrees to + 75 degrees. The 5080X has power extension from 10 ft.-16 ft. with a manual pull out to 20 ft. The 5080XP has power extension from 10 ft.-16 ft. with a manual pull out to 20 ft. and is standard with wireless proportional controls. Unlimited power rotation. Rotates on a gear bearing driven by a worm gear box with a 45:1 ratio. Both load sensor & anti two-block are standard. All cylinders have a integral counterbalance valve for safety, this valve holds the load in the event of hose failure and controls the rate of boom decent. Worm gear winch with 38:1 ratio is standard. Optional wireless controls available for the 5080X with the on/off control system. 72,000 ft.-lb. moment rating and 10,000 lb. max capacity. Liftmore crane bodies are designed to maximize the abilities of the crane matched on to an appropriate chassis. ​and answer any questions you may have. We're here to help.